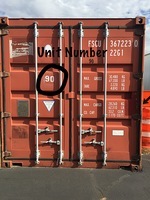 This unit will fit about 2-3 bedrooms worth of boxes as well as some bigger furniture like beds, couches, or appliances. 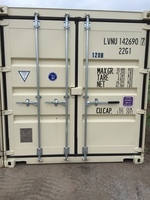 Brand new storage container. Easy to open and close. This unit will fit about 2-3 bedrooms worth of boxes as well as some bigger furniture like beds, couches, or appliances. Unit is the about the size of a 1 1/2 car garage. It fits the contents of a fully furnished 3-5 bedroom house, including oversized items such as a couches, beds, dressers, a refrigerator, a washer/dryer, a dining room set, an entertainment center and several large boxes. Most vehicles, boats, and commercial trailers will also fit, but be sure to measure first.